I am a recent Charter cable TV subscriber (although I have been a Charter internet subscriber for over a decade). I subscribe to HBO and Cinemax, which gives me the HBO Go and Max Go on-demand options, both which work flawlessly for me. 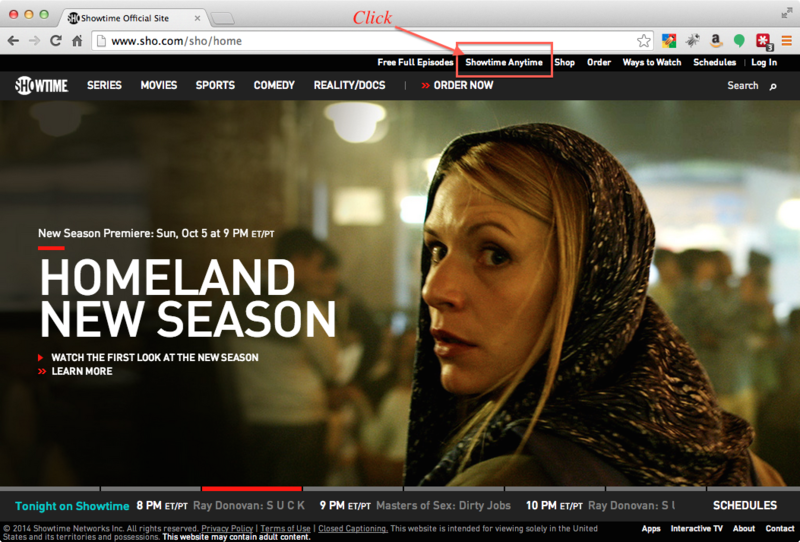 I also subscribe to Showtime, which gives me the Showtime Anytime on-demand option. This has been nothing but a headache so far. 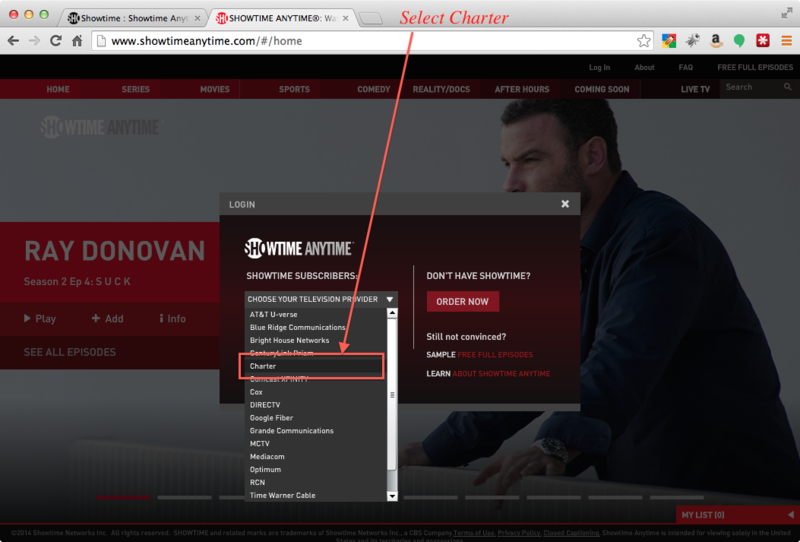 Unlike the two Go apps, Showtime Anytime requires that you register before your Charter login will give you access to their premium content. This in and of itself is annoying, but what makes it far worse is that in all the places where they tell you about this registration requirement, they provide no hyperlink to aid you in figuring out where/what exactly they are asking for, and so far, I have never been able to login. 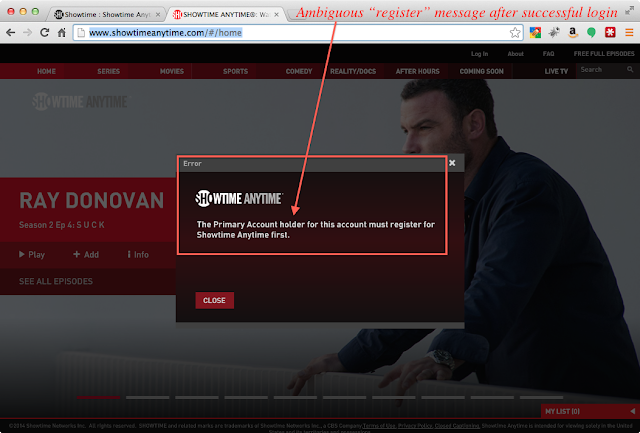 Error: The Primary Account holder for this account must register for Showtime Anytime first. 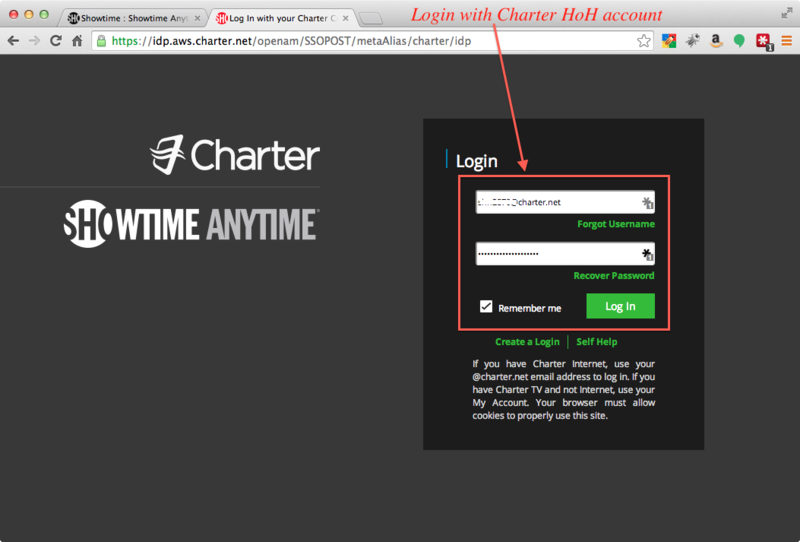 As best I can ascertain, via meager online resources and very poorly informed help from Charter support, the most important thing is that you use the Charter "HoH" (Head of Household) email address for logging into Showtime Anytime. It is frustratingly vague about the Showtime-specific details. 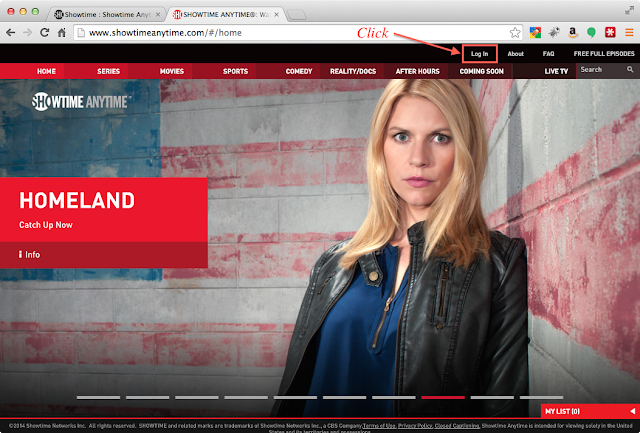 For example, it doesn't include any reference to the fact that you will be required to "register for Showtime Anytime", much less a link to the registration page, or other useful specifics. Once I have successfully authenticated on the Charter site, regardless of which browser or mobile client I use, I get the same vague error message shown here, along with a screenshot from Chrome on Mavericks, and the iOS 7 app. As far as I can tell, I've jumped through all the correct registration hoops. 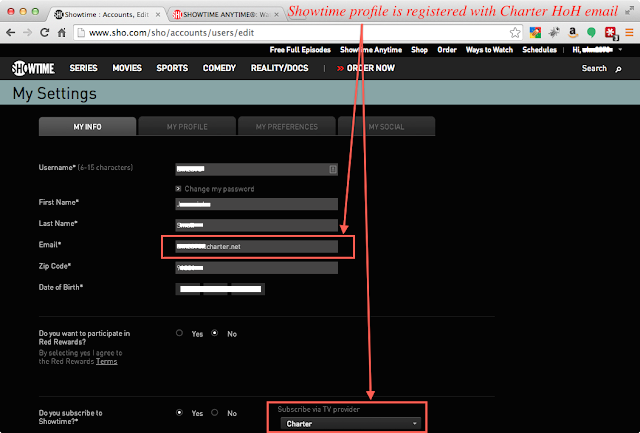 I created several different accounts on the annoyingly long and intrusive Showtime registration page, and finally have settled on one that is based on my Charter HoH account, but all to no avail. I still always get the annoyingly ambiguous and unhelpful message from Showtime, "The Primary Account holder for this account must register for Showtime Anytime first." Great post. This was very descriptive. I also had the exact same issue you had. Down to the "T". I am not sure if you were able to fix it. But this is what I did and it worked for me. I went into my Charter accounts and changed my HOH email to one of my secondary emails. Then I switched the HOH email back to the original one. 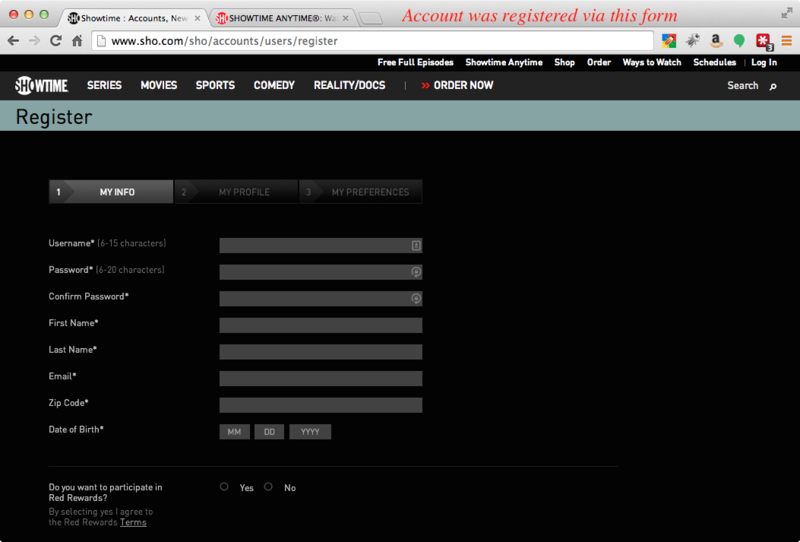 After that I was able to log into Showtime Anytime and it asked me to fill out my name and register my account. Hope this helps. I'm having the same problem as well. Driving me nuts. Tried to switch the HoH to no avail though :( Hopefully someone will find a solution. Exact same problem here. Except I have been a showtime subscriber for several years and had been using showtime anytime with no problems ever since it was first made available to charter customers and so I already had a showtime account set up. 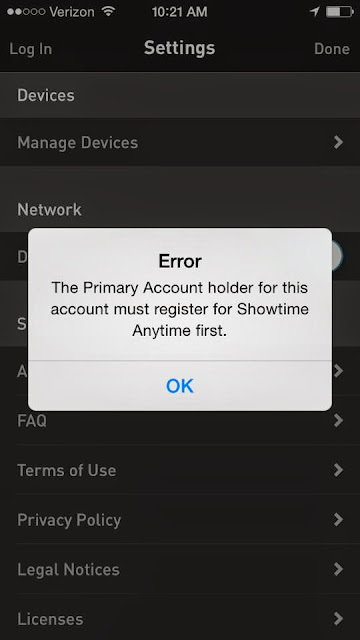 But now all of a sudden the only way to get the app to work is if you register for a brand new showtime account AS YOU LOG INTO THE APP because it does not provide the option to log in as an existing user. To me this is the key issue! 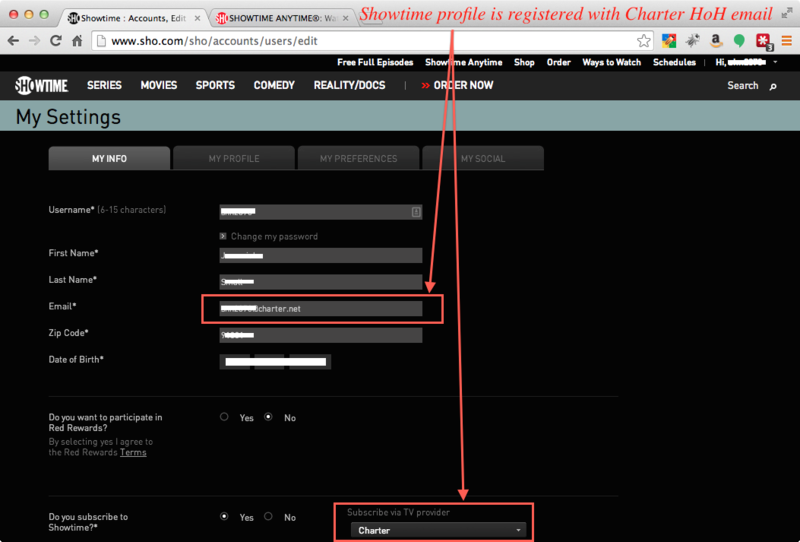 I successfully logged in this morning by creating a new showtime account using my husband's email. Then when I clicked on manage devices from within the showtime anytime app it showed all of the devices that I had previously used to access showtime anytime, including my phone. it showed I was logged into both my original account and the one I created under my husband's email on the same device. Either way, in what world has there ever been a website or app that didn't offer as an option to sign in to an existing account??????!!!!! "Zip code verification is required for login through Charter.net. This is another layer of security for Charter customers, helping ensure that email access is protected. Hackers may attempt to hijack email addresses and use them for spamming. Requiring zip code verification in addition to a password, helps keep hackers out. Charter is committed to maintaining your privacy, and this additional login credential through charter.net is just one more way to ensure its protection." Somebody at showtimeanytime should fix their script. I'm having the same problem and have called Charter twice now to get it resolved. The rep said tonight that the problem may be related to a new system that they've implemented that handles the authentication. No idea if that is correct. In any case, DEMAND A CREDIT from Charter for this problem. Their first response will be, "We don't provide credits for free services." 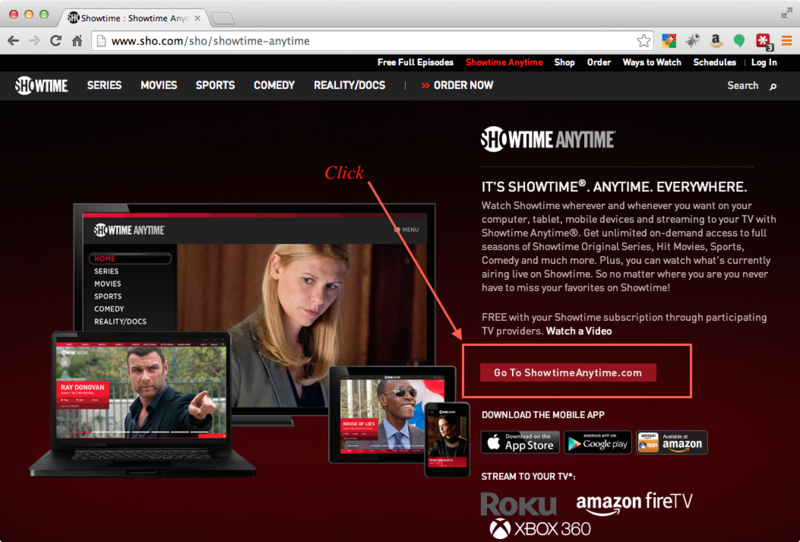 Respond by reminding them that you are paying for Showtime, that access to the Showtime Anytime service is "not a free service," and that if it were, Charter would not require you to pay for Showtime in order to gain access the Showtime Anytime content. I was able to get a $10 credit for my 7+ days of frustration. The only way to get this resolved is to make Charter and Showtime share the pain that we customers are feeling. Hi everybody, I had the exact same problem and this was how I fixed it. I logged in to showtime anytime from a browser and I went to manage devices, turns out I had reached the max (5 devices) allowed, so I deleted all my old phones and tablets. Once I did that I could now access the app from my new tablet and phone. I hope this helps. I had same issue. I went to showtime website and registered. then went to showtimeanytime and created a new account and then went to the showtime anytime app and it worked after putting in user ID/password for charter. Same issue, but this helped a great deal!!! Thanks so much. On May 22, 2017 I encountered the identical problem. After an extended period of frustration I call Charter Technical Support and wound up with a most patient and helpful technician in the Internet Department. 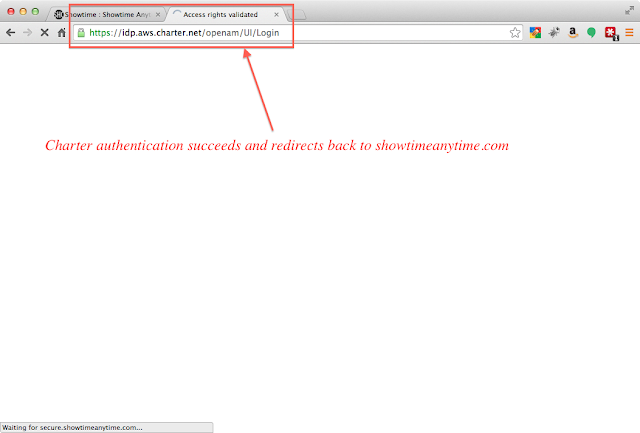 Ultimately he said he "re-synched" my apps and had me try to log in at Showtime Anytime again. Amazingly, a registration page popped up and all has worked perfectly. February 2018 CONFIRMED FIX ... Talk to technical support (Charter/Spectrum) and ask them to Re-Sync you Apps / Re-Sync your Account. That will then allow you to register, access the various apps, and remove parental controls.